Have we entered the age of NoOps infrastructures? Hardly. Old-style system administrators may be disappearing in the face of automation and cloud computing, but operations have become more significant than ever. As this O’Reilly Radar Report explains, we’re moving into a more complex arrangement known as "DevOps." Mike Loukides, O’Reilly’s VP of Content Strategy, provides an incisive look into this new world of operations, where IT specialists are becoming part of the development team. In an environment with thousands of servers, these specialists now write the code that maintains the infrastructure. Even applications that run in the cloud have to be resilient and fault tolerant, need to be monitored, and must adjust to huge swings in load. That was underscored by Amazon’s EBS outage last year. From the discussions at O’Reilly’s Velocity Conference, it’s evident that many operations specialists are quickly adapting to the DevOps reality. But as a whole, the industry has just scratched the surface. This report tells you why. 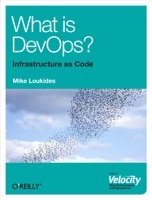 Finally I get this ebook, thanks for all these What is DevOps? I can get now! What is DevOps? was the best books I ever buy. What is DevOps? did exactly what you said it does. I will recommend you to my colleagues. What is DevOps? is the most valuable books we have EVER purchased. I'd be lost without this. I am completely blown away.